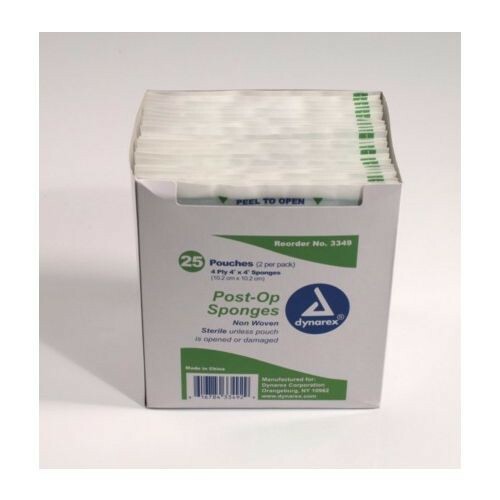 Dynarex 3349 Post-Op Sponges 4 x 4 Inch 4 Ply, Sterile are highly absorbent sponges to aid in wound cleaning. Its wicking action from the non-woven cotton is helpful in taking in blood and fluids. It also offers 4-ply thickness to add extra absorbency. The gauze post-op sponge is packaged sterile with two sponges contained in the easy-to-peel pouch. This makes opening quick and easy when treating wounds for aseptic handling for superior patient care. You may also be interested in sterile alcohol prep pads by Dynarex.